For its appropriate work tracker use a sufficient number of service parameters which could be observed by third party in link. For example in links to campaigns, offers or postback. If you want to make these links more readable, you can use built-in customization. The customization menu is located in Settings, at URL Customization tab. Also, note that you can specify your own key in the settings for each campaign. Standard parameters will work even after you change them, so all of your old links will work, even if you change something in URL Customization. After that you'll be able to get access to your tracker only with the direct address http://domain.com/panel.php. http://domain.com and http://domain.com/index.php will open blank page. 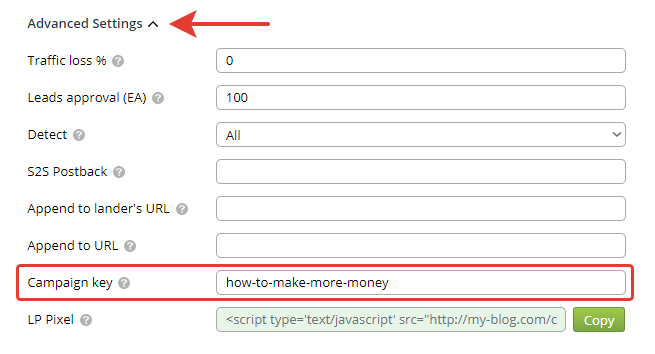 In some traffic sources it is easier to pass the moderation if you make a link to campaign looks like link to blog. You can do this by adjusting server’s and campaign’s settings. The server needs to be configured only once and this will be enough for all campaigns on one domain. In your web-server configuration you need to specify the path /click.php?type=404 for 404 errors. After that reload your web-server.